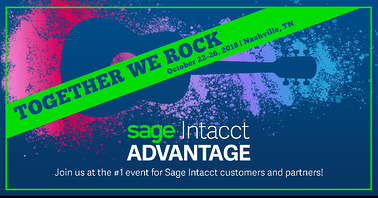 AcctTwo, Intacct's overall Partner of the Year for five years running, will be a Gold Sponsor at this year's Sage Intacct Advantage Conference at the Gaylord Opryland Resort and Convention Center in Nashville, TN from Oct. 22-26. Advantage 2018 is the must-attend event for Sage Intacct customers and partners. From introductory workshops to advanced training, a full range of sessions are available to customize your conference experience. Choose from hundreds of sessions that specifically target your interests to get the most value from Advantage 2018. In addition, attendees can access direct support from Sage Intacct experts, meet Sage Intacct’s partners to learn about other software systems already integrated with Sage Intacct, and network with peers at our evening events to share best practices and unwind after a productive day. Optional pre-conference training courses are also available for more in-depth education. Sandy McClure, Professional Services Manager, will present alongside Allison Webb of Capin Crouse on the topic: Segregation of Duties in a Nonprofit and How Sage Intacct Can Help on Wednesday at 11:30am. Glen Strack, Senior Professional Services Manager, will present on Building Dimension-Based Financial Reports for Your Nonprofit on Wednesday at 1:45pm. Sandy McClure presents a second time on How Spend Management Assists Nonprofits in Keeping on Budget on Thursday at 8:00am. Keith Karnes, Director of Sales Engineering, will demo the AcctTwo Period-End Allocations Module on Thursday at 1:45pm during the session, Putting Nonprofits Advanced Allocations in Focus. *This session is geared towards nonprofits, BUT the Period-End Allocations Module has wide ranging applications for for-profit companies as well. Chris Carter, Vice President of Professional Services, will participate in a discussion on Implementation Best Practices on Thursday at 4:30pm. Lincoln Donaldson, Professional Services Manager, will present on Project Accounting Workarounds and Customizations on Friday morning at 8:00am. Don't miss this event! You can take a look at the agenda for the week, plan out your schedule, and make sure you're available for all the entertainment. And please remember to stop by booth #22 to say hello to us. If you have any questions or would like to get a complimentary evaluation of your finance and accounting function, please contact us directly. Delivering the future of finance and accounting, AcctTwo is a leading consulting firm and provider of Managed Accounting Services. Our sophisticated systems solve the issues growing middle market companies and nonprofit organizations face today. AcctTwo is also a reseller of cloud-based accounting, ERP, Financial Planning & Analysis (FP&A), and Corporate Performance Management (CPM) software. We provide the people, processes, technology, and office facilities to perform these functions while allowing clients to collaborate interactively through an online portal. AcctTwo is headquartered in Houston, Texas and has been named Sage Intacct’s overall Partner of the Year from 2014 through 2018. For more information, please visit www.accttwo.com or call 713-744-8400. Advantage 2018 at your fingertips! 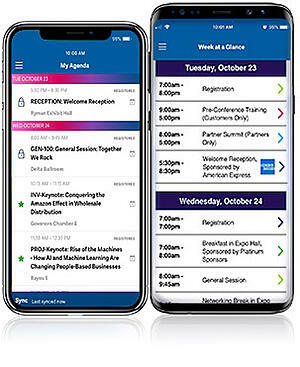 Make the most of Sage Intacct's Advantage 2018 with the conference mobile app—available for Apple iOS and Google-Android devices.